It won’t be obvious to your customers, but drop shipping is a completely different way of fulfilling orders that relies a lot more on your vendors. This article quickly reviews the traditional retail fulfillment model and compares it to how drop shipments work. You may have heard about sending drop shipments or running a dropshipping business, but what is dropshipping exactly? Dropshipping lets you count your chickens first because you know they’re going to hatch. In either the traditional fulfillment model or dropshipping, you’ll require some sort of vendor to purchase your products from. The difference is that the vendor in a dropshipping setup will be offering you additional services aside from just product. Not only will they store your products for you, but they will also take charge of the fulfillment and shipment for your orders. The vendor maintains and pays for storage, so no inventory is kept on-hand by your business. You don’t manage inventory, so there’s no need to calculate safety stock or reorder points. Your business can offer a wider variety of products, since your capital isn’t taken up by buying and storing products. The vendor takes care of shipping, so you’ll end up saving time by offloading the fulfillment. 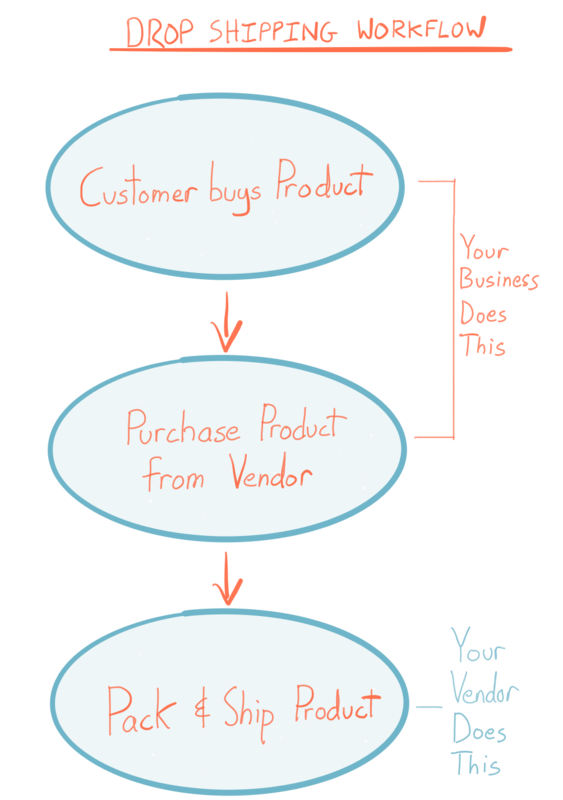 The product takes a direct route from vendor to customer, instead of passing through your business first. Dropshipping prices from vendors are higher because they’re providing a service on top of their products, which means margins for dropshipping products are lower overall. You’ll rely a lot on your vendor so you’re on the hook for their mistakes if product quality isn’t up to par, or if the shipping goes out late. The lower barrier of entry makes it a business model that’s rife for competition. What are you responsible for when dropshipping? When it’s done right, customers won’t actually know that a business is using a drop shipping model for fulfilling their orders. Let’s take the example of Archon Optical again. Archon Optical actually manufactures most of their eye wear themselves. That’s why they keep a detailed bill of materials for their products. However, during the summer time they send special promotional sunglasses to their customers as a “thank you” for purchasing in the past. Customers get an email with a site, visit it to select a color, choose a shipping option, and then wait for the sunglasses to arrive. When the free sunglasses arrive in the mail, as far as the customer knows, everything was done by Archon Optical. 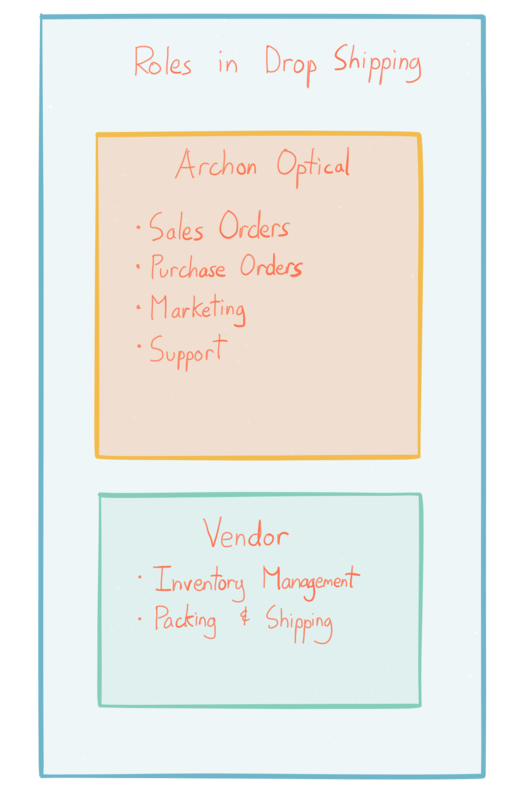 But in the case of these promotional sunglasses, Archon Optical has one of their suppliers act as a drop shipper, so the two entities work closely to provide the customer with a cohesive and consistent experience. In either case, all the customer sees is a box with Archon Optical’s logo is on it, alongside their return address. From all accounts, that shipment will appear to be the same as a regular pair of glasses from Archon Optical. The company would create the marketing website for the sunglasses, track customer orders, provide support for questions about the sunglasses, and coordinator orders with the drop shipper. However, the fulfillment and shipping will all be done by the vendor, who acts as the drop shipper. The drop shipping business model isn’t right for everyone, but it is a very flexible option for instances when storage space and capital are tight, or if you see a market for something that isn’t easily available in your area. Did you know that inFlow Cloud can help you manage your drop shipments and customer sales, all in a single app? 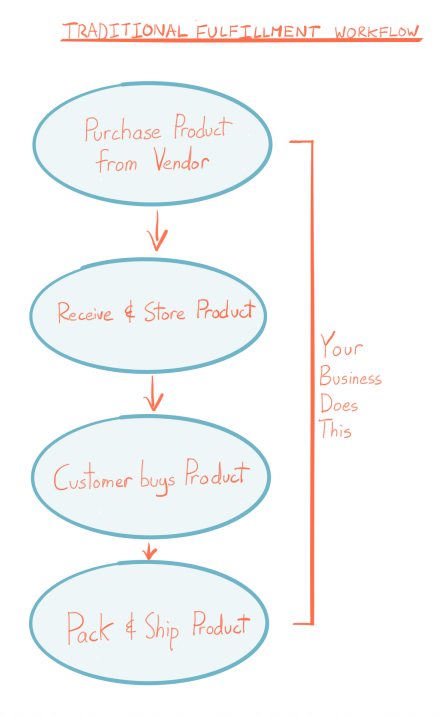 All you need to do is start a sales order to indicate what your customer is buying. Then you can create a drop shipment in just two clicks and then email that PO to your vendor. Want to speed up drop shipping with just one program? inFlow Cloud can help.